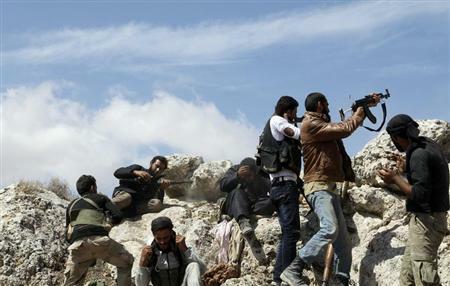 BEIRUT (Reuters) - Hundreds of rebels have pledged allegiance to al Qaeda-affiliated forces in northern and eastern Syria, activists and Islamist sources said on Friday, strengthening the group's control in the region. Not only individual fighters, but entire units have joined the small but powerful al Qaeda-linked groups - the Nusra Front and the Islamic State of Iraq and the Levant (ISIL) - in recent days, according to the sources inside Syria. "This is a sign the radical groups are still growing in power. This region could fall to the jihadists," said an activist in the eastern town of Raqqa, who asked not to be identified. "We may see this become a trend." Clashes have been intensifying between Nusra or ISIL and the less effective but more moderate forces that make up the majority of opposition fighters, especially in opposition-held territory along Syria's northern and eastern borders. Another group, the God's Victory Brigade, said in a statement on Facebook that all of its leaders and fighters had pledged loyalty to Nusra Front. "God's Victory Brigade, which is comprise of 15 battalions, had pledged its allegiance to the Nusra Front, giving complete submission (to it) in times of hardship and of ease," it said. A video uploaded by activists from Raqqa on Friday showed a massive convoy of fighters on cars and trucks with artillery and machine guns as they waved black flags. The video's title said it showed a newly unified force of Nusra fighters and other rebel battalions who had recently pledged loyalty. Some activists said the new Islamist loyalty pledges were timed to combat increasing hostility from rival rebel groups, including the Supreme Military Council, the armed wing of the opposition's Western-backed umbrella leadership abroad. Islamists have steady, private sources of funding and incorporate experienced militants, many of them from abroad, who have fought U.S. forces in Iraq or Afghanistan.